As the programme progressed, I noticed similarities between wassail and punch, although they have many differences. Nowadays, pictures and stories of people gathered around a wassail bowl are often used to illustrate punch drinking, and the two have merged into a common collective memory. The term ‘wassail’ comes from the Norse, meaning ‘to your health’, and was first recorded by Geoffrey of Monmouth in the 12th century when writing about King Vortigern in the 5th century. In medieval times, drinking and wassailing were closely connected with singing; the earliest recorded carols of the 13th century refer to wassail. The drink served was generally mead, made of ale brewed with spices and honey. It was popularly served at Christmas and became associated with the feast on Twelfth Night. A manual for court etiquette during the reign of Henry VII, at the end of the 15th century, gives rules for the formal ritual of wassailing. The countryside had a parallel culture of wassailing, which was a raucous male affair with cider-drinking around a bonfire in the orchard, in a ceremony to encourage a good crop the following year. Another wassail-style drink involved roast crab apples, dropped into steaming ale and honey mead, which burst open and covered the surface of the ale with fluffy white apple fruit – called Lamb’s Wool. The connection with harvests continued. A number of punch bowls dating from the 18th century were specially decorated to celebrate a successful harvest, some with ‘Success to the Plow’ written in the bowl and decorated with agricultural scenes. Punch was often served at harvest dinners into the 19th century. As the pagan connections of the orchard fertility ceremony were frowned upon by the 16th century reformers, it was banned in 1577. It appears to have continued in different forms, with children singing the songs and carrying round a bowl of wassail to neighbours. Under the Commonwealth (1649-60), attempts were made to restrain all Christmas festivities, including the tradition of drinking wassail on Twelfth Night. After 1660 Christmas festivities returned with a vengeance; Pepys talks of drinking wassail and a Christmas draught of ale with apples drunk from a wooden cup. At this time punch started to become popular – taking on some of the popular traditions of wassail. Instead of pagan connotations, punch symbolised trade, Empire and the modern world. Wassail bowls were made of wood or pottery, usually tall and steep-sided with a lid which often included a spice box. Lignum vitae wood, from South America, was particularly popular as it is particularly resistant to warping when wet; it was often used for wassail bowls used at sea. 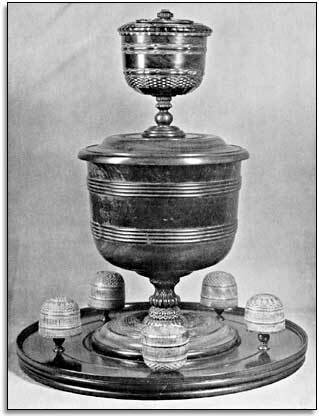 Both punch and wassail were served from a large communal bowl, which retained the wassail bowl shape of a steep sided bowl based on a pedestal. The bowl came with a platter – useful in protecting the table from drips when serving and a lid with a spice box incorporated into the knop. Some bowls seem to have come with cups. Punch bowls with platters, lids and cups continued in Sweden, Germany and America, but died out in Britain by the mid 18th century. 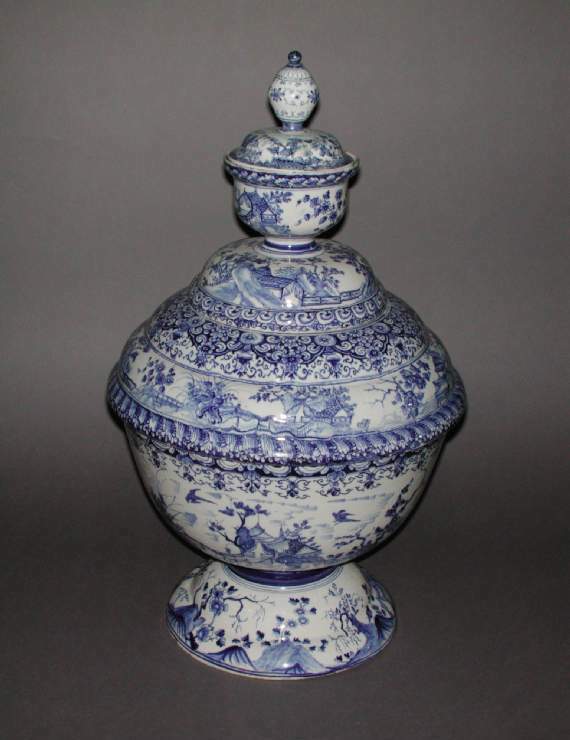 Lidded bowls remained most popular in Germany, although the spice boxes in the lid did not continue as a tradition. ‘Toasting’ fellow drinkers (instead of saying ‘wassail’) came from the tradition of floating a piece of toast in a glass of wine, beer or mead, which was supposed to improve the flavour. My initial experiments with floating toast in a glass of red wine produced the surprising result of appearing to soften the tannins. I am now planning further experiments. The custom of serving toast in a drink continued; early recipes for punch often include toast in the 17th and 18th centuries. Beer or ale was not included in punch recipes until the early 19th century, when it created a drink resembling the earlier mead wassail drinks, but on the whole, punch recipes have a higher alcoholic content, being made with spirits, and use sugar rather than honey. Today mulled wine is often served instead of either wassail or punch. Nutmeg was used in recipes both of wassail and punch. Ginger was included in wassail, rarely in punch. By the 19th century, books on Christmas entrenched certain traditions. One was that of wassailing while singing Christmas carols and going from door to door, carrying the bowl of wassail drink, singing and drinking. There were drinking songs referring to punch – but these seem to be more the type of song drunk in revelry in a tavern. Decorating wassail bowls with greenery was common and this transferred to punch bowls, not just for Christmas but for any festive occasion. The George Jones maiolica punch bowl opposite, circa 1873, has the festive greenery incorporated into the design. There is no special tradition of drinking a bowl of punch on Twelfth Night, or of toasting the apple trees.